I hadn’t seen, let alone eat, a garibaldi biscuit in at least ten years so you can imagine my delight when Mr T opened the tin and offered me one. Mr T is my 92 year old friend who I’ve been having a Thursday morning cuppa with since January. I was very inspired several years ago by the book ‘Tuesdays with Morrie'( Mitch Albom) which I read as part of a book group. It’s about a chap who learns that his favourite teacher is dying. Like all of us his plan to keep in touch didn’t happen and twenty years had passed and soon any opportunity to keep in touch would be lost. He resolves to meet up with his teacher every Tuesday. Morrie is sufferring with Motor Neurone disease and their meetings record his deterioration, managed with extreme optimism and even joy. He even arranges a pre death funeral party whilst he was able to host and enjoy the company of his friends and families. My Mr T isn’t in the least bit ill or disabled, although he is ‘getting on a bit’ and I felt that to give him the time and friendship he deserves we needed to have a regular appointment. Thursdays with Derwent are now fixed point in my diary. Usually he visits me as ironically he’s more mobile than me most of the time. We have a thirty minute chat then ten to fifteen minutes to ‘wind it up’ before I need a rest from all the excitement! Im not even exagerating about the excitement. Derwent has had a fascinating life. We met around fifteen years ago when he visited my gallery. His wife was dying of cancer, leaving him alone with two teenage daughters. He’d been widowed before, about thirty years earlier and had two children and now greatgrandchildren from them. Born in the 1920s to a mathematician and a wise and educated mother, Derwent grew up in a priviledged family and as he says a privileged time. His childhood was in Scotland, he studied at Cambridge had careers in both the Royal Navy and as a musical professor so there’s always something to talk about. We agree to disagree about somethings too. He doesn’t eat vegetables or salad, can’t understand the fuss about ‘organic’ ( and informs me of the true meaning of the word and its current misuse) and liberally uses ’round up’ in his garden. We do however share a love of art and books. I appreciate music, he has an astounding knowledge of it although when I excitedly told him about getting tickets to see Kate Bush, he had no idea of who she was and wondered if I had seen or heard of Alfred Brendle. We exchange books and he brings catalogues from the exhibitions he has seen. When I visit him I get to see his latest acquisitions of magnificent Folio Society books or paintings from local and London Art galleries. Well the last visit all the art and literature was eclipsed by the garibaldi biscuits! He hadn’t had his favourite biscuits either for a long while as he thought the local grocers had stopped selling them. I found them there a few days later and was then inspired to find a recipe for them. Delia had a great one and today I adapted it to be wheat, dairy and sugar free. I took the results to a friends coffee morning and they were tested by three intrigued ladies. The response was positive, or maybe just polite. Either way I liked them and will add them to my list of ‘treats’. 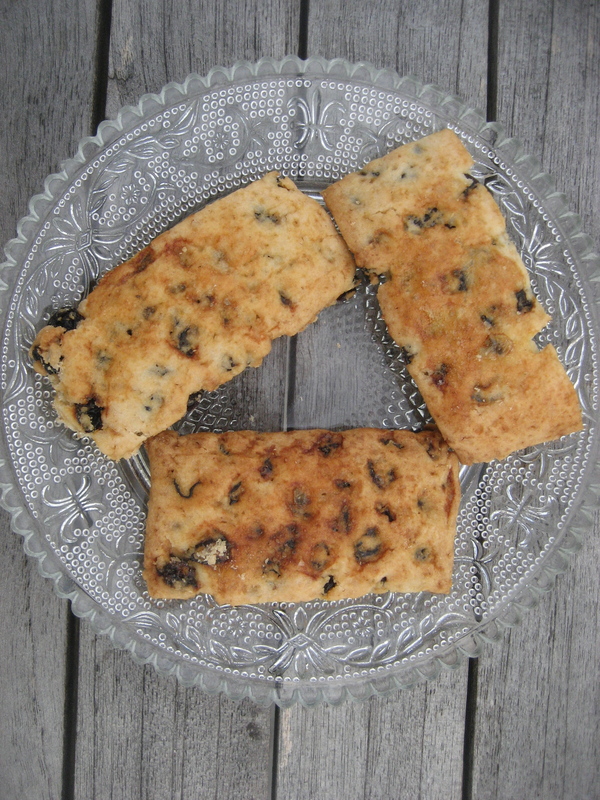 Wheat, dairy and sugar free Garibaldi biscuits. a little spare xylitol for sprinkling. Put the flour, salt and butter together in a mixing bowl and rub to a fine breadcrumb texture. Add the sugar and then the milk in tablespoonfuls until the dough sticks together. As Gluten free flour is a nightmare to work with, I floured a marble slab and put a layer of cling film down. Then I placed the dough on top. I then covered it with a second sheet of cling film and rolled the dough out to about 20x 30cm rectangle. Removing the top layer of cling film, I sprinkled the currants over half the surface and folded the other half over it. Replacing the cling film, I then rolled the dough out to as close to the original size a possible. Remove the cling film, cut into slices and place onto an oiled baking sheet. brush the egg white over the biscuits and sprinkle some xylitol before baking in a hot oven ( 200 degrees) for 10-15 mins. They should look a golden brown when done. gently slide off the baking tray and place on a wire rack to cool. I think it’s wonderful that you do this.